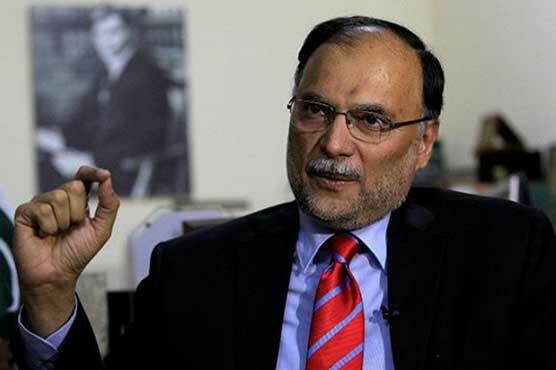 ISLAMABAD: Pakistan Muslim League-Nawaz (PML-N) leader Ahsan Iqbal on Sunday lamented that the Pakistan Tehreek-e-Insaf (PTI) government was not serious about the health of former prime minister Nawaz Sharif, who is serving a seven-year sentence at Kot Lakhpat Jail in Lahore. In a statement, he said that Prime Minister Imran Khan and Punjab Chief Minister Usman Buzdar would be responsible if anything adverse happens to the former premier. He said that the government had adopted a similar attitude to the health of former first lady Begum Kulsoom Nawaz. He added that PML-N had adopted a legal procedure for the provision of healthcare facilities to the three-time prime minister. He also advised party workers to be patient and hope that the former premier would soon get relief. He also warned that the party workers would be compelled to protest if the government did not review its decisions over Nawaz’s health. On Saturday, Nawaz’s daughter Maryam Nawaz met her father along with his personal physician Dr Adnan Khan at the jail. They did so after receiving permission from the interior ministry. During her visit, a large number of party workers thronged the prison and chanted party slogans. They also brought a passenger train on nearby track to halt and mounted the engine to shout more slogans. PML-N had also requested the Punjab Home Department to allow ex-PM’s personal physician to be present at the time of former PM’s checkup which was arranged in the light of his worsening renal health. “Denying access to his personal physician is a violation of his rights and his current medical condition merits a visit by his personal physician,” a letter signed PML-N MPA Malik Nadeem Kamran reads. The letter was also shared by Maryam on her Twitter account. “In view of deterioration of MNS’s renal function, authorities are arranging for a specialist to examine/evaluate him at the jail today. Presence of MNS’s personal physician during the examination is vital. A written request to the Home Office in this regard has been dispatched,” she tweeted. On Friday, Maryam Nawaz posted a series of tweets about her father’s health. In the last tweet, she that Nawaz’s blood samples were taken to check his renal function (urea & creatinine). “Thank you very much. I hope the lab results, as soon as they come, will also be shared with me,” she added as she thanked the government for allowing her to meet the incarcerated Nawaz. Earlier, she had taken to Twitter to protest the government’s refusal to meet her father. “If his renal functions are not checked for any further deterioration & if his doctor & I are not allowed access to him, I will go and stand outside the jail tomorrow till the access is granted,” she tweeted on Friday. Nawaz has been in jail since December 2018 following his conviction in Al-Azizia corruption reference in line with the Supreme Court’s (SC) July 2017 verdict.